The term Clematis is commonly used in a generic sense, referring to a number of species. They are perennial herbs or vines, rather woody, and climbing by the bending or clasping of leaf-stalks. The leaves are pinnate, variously cut or lobed, opposite; the flowers are showy, variously colored, and with only one floral covering, namely, the calyx (sepals), the corolla (petals) being wanting or rudimentary. The various species belong to the Crowfoot family. The plants are extensively cultivated as ornamental plants. The common clematis, Traveler's Joy, or Virgin's Bower, is a climbing plant with three smooth leaflets which are more or less cut or lobed and heart-shaped at the base. The flowers are white or whitish. It is quite common along river banks and flowers in July and August. In the language of flowers clematis signifies artifice and mental beauty. On the continent of Europe clematis erecta and clematis flammula are used by beggars to produce artificial ficial ulcers on their limbs to incite pity. 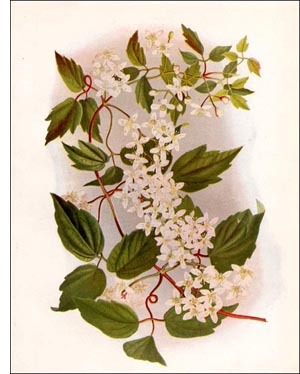 In America, according to Geyer, the roots of a species of clematis are used by the Indians as a stimulant to horses which fall down at the races. The scraped end of the root is held to the nostrils of the fallen animal, which begins to tremble, and then, rising, is conducted to water to refresh itself. As already indicated, there are many species of clematis in America, Europe, Asia, and India, and in other countries and islands. Besides the many culture varieties derived from wild species directly, there are numerous varieties the result of artificial crossing (cross-pollination), of which the following are, perhaps, the most handsome: The Jackmann, John Gould, Lucy Lemoine, Miss Bateman, Prince of Wales, and Sir Garnet Wolseley. Clematis makes beautiful arbor plants and may be trained to almost any sort of support. They require considerable sunlight and fairly good soil. They are propagated from cuttings and grafting.